Go to original pattern for design DROPS 77-1. 350-350-400-450-500 gr nr 02, light turquoise. 350-350-400-450-500 gr nr 10, dark turquoise. 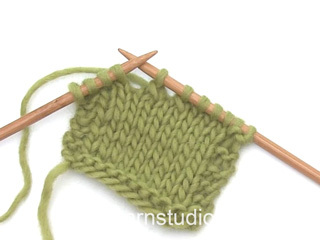 Gauge: 10 sts x 12 rows with 2 strands Paris on needles 9 in stockinette st = 10 x 10 cm. All decs are made from right side. 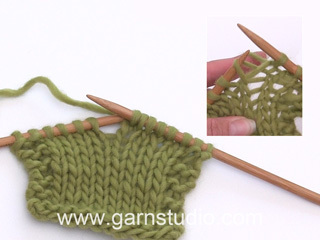 Dec 1 st inside 1 edge st knit in garter st as follows: After edge st: Slip 1 st as if to knit, K 1, psso. Before edge st: K 2 tog. Front: Cast on 39-45-49-53-57 sts on smaller needles with 1 strand light turquoise + 1 strand dark turquoise and knit 2 rows garter st. Change to larger needles and stockinette st but keep the 2 outermost sts at each side in garter st (for edge of split). When the piece measures 10 cm knit stockinette st over all sts. When the piece measures 12 cm inc 1 st at each side. 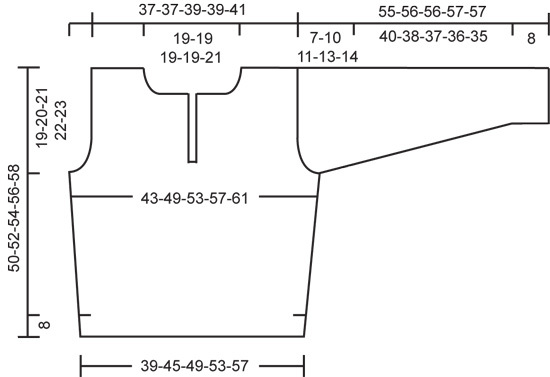 Repeat this inc when the piece measures 24 cm = 43-49-53-57-61 sts. When the piece measures 28-29-30-31-32 cm knit 4 rows garter st over the center 5 sts (knit the remaining sts in stockinette st as before). Neck opening: after the 4 garter st rows bind off the center st and put half of the sts on a st holder. 1st side: = 21-24-26-28-30 sts. Knit stockinette st keeping 2 sts at the center front edge in garter st throughout. Armhole: When the piece measures 31-32-33-34-35 cm bind off for armhole at side every other row: 3 sts 0-1-1-1-1 time, 2 sts 1-0-1-2-2 times and 1 st 1-3-2-2-3 times = 18-18-19-19-20 sts. 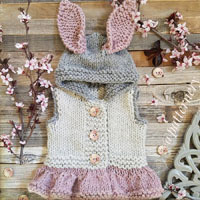 Neck: When the piece measures 39-41-42-44-46 cm knit 2 rows garter st over 6-6-6-6-7 sts at the center front edge. 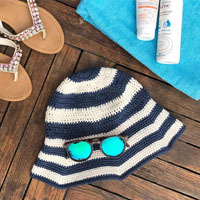 On the next row bind off the outermost 5-5-5-5-6 sts for the neck. Then dec 1 st for the neck every other row 4 times - see knitting tips = 9-9-10-10-10 sts remain on shoulder. 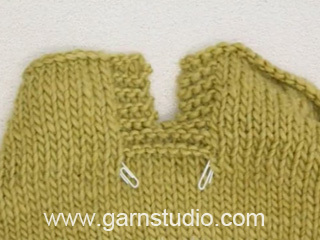 Knit the outermost st for the neck in garter st to finished measurements. Bind off when the piece measures 50-52-54-56-58 cm. 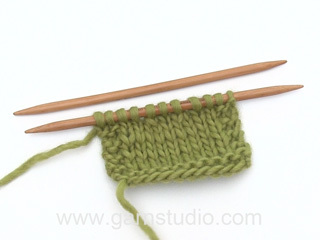 2nd side: Put sts on st holder back on needles and knit the same as the 1st side, reversing shaping. Begin 1st row from the center front. Start by picking up 1 st in the bound off st, knit that st together with the 1st st (this reinforces the bottom of the split). Back: Cast on and knit the same as the front, omitting neck split/shaping. Bind off for armhole as on front = 37-37-39-39-41 sts. When the piece measures 47-49-51-53-55 cm knit 2 rows garter st over the center 19-19-19-19-21 sts. On the next row bind off the center 17-17-17-17-19 sts for the neck. 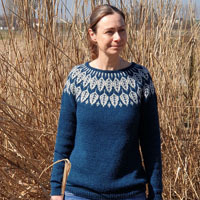 On the next row dec 1 st at each neck edge - see knitting tips = 9-9-10-10-10 sts remain on each shoulder. Knit the outermost st at neck edge in garter st to finished measurements. Bind off when the piece measures 50-52-54-56-58 cm. Sleeve: Cast on 23-24-25-26-27 sts on smaller needles with 1 strand light turquoise + 1 strand dark turquoise and knit 2 rows garter st. Change to larger needles and stockinette st. When the piece measures 8 cm inc 1 st at each side every 7.5-7-5.5-5.5-4.5 cm a total of 6-6-7-7-8 times = 35-36-39-40-43 sts. When sleeve measures 48-46-45-44-43 cm bind off at each side for sleeve cap every other row: 3 sts 1 time and 2 sts 1 time, then dec 1 st at each side every other row until the piece measures 53-54-54-55-55 cm, then bind off 3 sts at each side every other row until the piece measures 55-56-56-57-57 cm, bind off the remaining sts. Assembly: Sew shoulder seams. Sew in sleeves. Sew sleeve and side seams down to split. There will be 4 rows garter st above split opening. Hei Ann-Elin. Opskriften er komplet. Forstykket staar som förste i opskriften inclusief begge dele efter splitten.